Here is the package deal you have been waiting for. 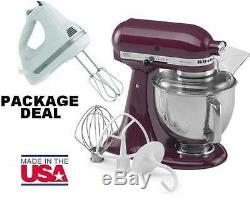 Brand new made in usa stand mixer with a free hand mixer to make your kitchen complete. The free hand mixer is a refurb unit and the made in usa is only for the stand mixer not the free hand mixer. KitchenAid's Artisan stand mixer is a substantial piece of equipment: 325 watts of mixing power make child's play of creaming butter, kneading dough, and whipping cream. The kid in you will appreciate how quick and easy it is to mix up a batch of cookie dough. This model comes with three attachments: a flat beater for making batter, meat loaf, and all textures in-between; a wire whip for egg whites, mayonnaise, and more air-infused creations; and a hook for mixing and kneading yeast doughs. All three are solidly constructed and easily secured to the beater shaft with a simple twist. This model also includes a pouring shield for guiding ingredients to their proper destination, and the bowl itself locks tight to the base. Standing about 15 inches high, jutting out a foot, and weighing more than a grown woman's bowling ball, this stand mixer isn't the sort of appliance you'll wipe down and put away. Better to find a square foot of free counter space for easy access; besides, this machine is as pretty as it is rugged--you'll want to show it off. The KitchenAid Artisan Series Stand Mixer has a strong 325-watt motor that delivers the power to handle the heaviest mixtures, and mix large batches easily. The 5-quart polished stainless steel bowl with ergonomic handle is big enough to handle large batches of heavy mixtures. Its ergonomically designed handle is contoured to fit the hand and makes lifting the bowl more comfortable. The flat beater, dough hook, and the professional wire whip add to the versatility of the mixer. The dough hook mixes and kneads yeast dough, saving both time and the effort of hand-kneading. The wire whip incorporates the maximum amount of air in whipped mixtures for fluffier whipped cream and angel food cakes. This model also includes a 1-piece pouring shield for guiding ingredients to their proper destination, and the bowl itself locks tight to the base. The tilt-back mixer head allows for easy access to bowl and beaters. 325-watt stand mixer with 10 speeds and 67-point planetary mixing action. Solid, all-metal base; 5-quart stainless-steel bowl; 2-piece pouring shield. Uniquely styled tilting head allows clear access to the beater and bowl. Multipurpose attachment hub; flat beater, dough hook, and wire whip included. Measures 14 by 8-2/3 by 14 inches. ATTENTION ALL CUSTOMERS: ALL ELECTRONIC ITEMS ARE 110V. The item "KitchenAid Stand Mixer tilt 5-Quart ksm150psby Artisan Boysenberry + Hand Mixer" is in sale since Friday, January 20, 2012. This item is in the category "Home & Garden\Kitchen, Dining & Bar\Small Kitchen Appliances\Countertop Mixers".